How do I set up MS Outlook? Here is the basic information you need when setting up your email account. These settings apply to all devices. Incorrect Incoming or Outgoing mailservers. Username is not your complete email address. Outgoing Mailserver requires authentication is not checked, and should be. Outgoing SMTP port is not correct. Attempting SSL setup, but do not have an SSL certificate installed. 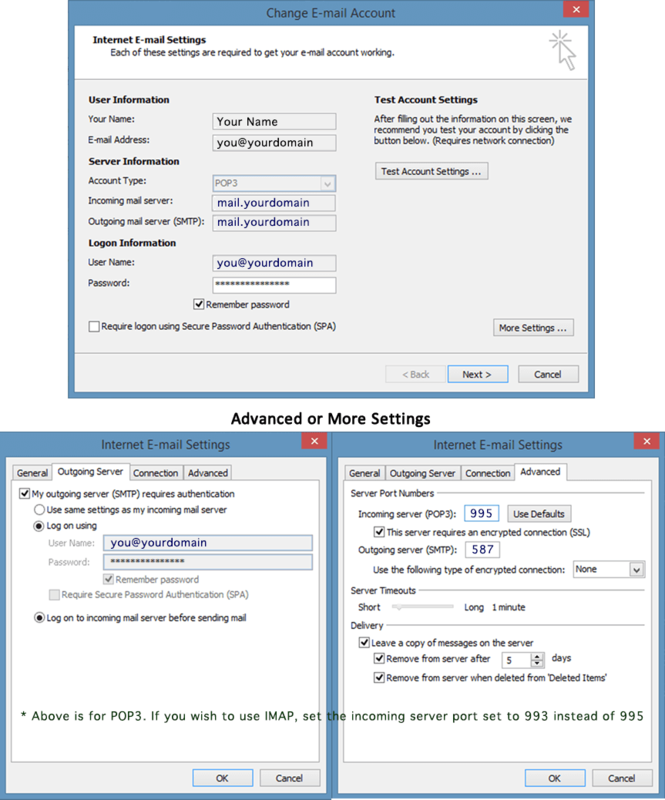 IMAP: If you choose to set your email client up as an IMAP account, your email messages will be stored on the server. Messages that have been read/deleted/replied to will show up as such, both on the server and in your mail application. IMAP accounts require more disk space than POP3 accounts, and you will periodically have to remove read/sent/deleted messages to avoid running out of server disk space. POP3: If you choose to set your email client up as a POP3 account, your email messages will be downloaded to your device and then deleted from the server according to your Advanced Settings. If you use multiple devices to check email, you will need to “keep a copy on server” for some period of time (3-5 days usually is sufficient) so that all your devices have a chance to retrieve your new messages. POP accounts require minimal disk space. For step-by-step instructions on how to add/change email accounts on your particular PC, iPhone, iPad or smartphone, use your Help function or Google “how do I setup a POP email account on my …” to find the instructions you need. How do I change Outgoing email port 25 to port 26? How to setup iPhone for a POP3 or IMAP?